More goals than Cristiano Ronaldo, more goals than Neymar, more even than West Brom and Crystal Palace - Harry Kane is having a stellar 2017. The Tottenham striker's sparkling form in front of goal this calendar year continued on Saturday as he scored twice in a 5-1 demolition of Stoke at Wembley. Kane has found the net 33 times in 32 league matches, part of 50 goals in 48 games in all competitions for club and country. The 24-year-old is closing in on a notable league landmark, set by the man to whom many see Kane as the natural heir - former Blackburn, Newcastle and England striker Alan Shearer. Kane's 33 goals are equal to, or better than, four current Premier League clubs this year - Swansea and Burnley (both 33), Crystal Palace (31) and West Brom (30). Across Europe's top five leagues - England, France, Germany, Italy and Spain - it puts him third on the list of league scorers in a calendar year, bettered only by Barcelona's Lionel Messi (38 in 35) and Paris St-Germain's Edinson Cavani (34 in 35). With four fixtures left in 2017, Kane has a good chance of reaching the 37 goals he needs to surpass Shearer, who, like Kane, led the line for his country and was a talismanic figure for his hometown club (in Shearer's case, Newcastle for whom he scored 206 league and cup goals). Kane's double against Stoke took him to 90 career Premier League goals, a mark he reached in 131 games. Only Shearer has reached this number quicker in the competition's history, doing so in 113 games en route to his record all-time tally of 260 goals in 441 games. Shearer played until he was 35. If Kane plays until the same age, that gives him 11 years in which to score the 170 goals he needs to match Shearer's tally, which he would manage by netting 15 goals a season until the end of the 2028-29 season. Oh no, not you again?! 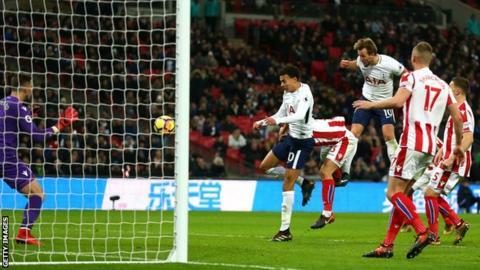 Kane's two goals on Saturday contributed to another heavy defeat for a Stoke side who will be sick of the sight of Spurs. For the first time in top-flight history, the Potters suffered a defeat by four goals or more to the same opponent in four consecutive games. Last season, City lost 4-0 in both league games against Spurs and also 4-0 in the game between the sides at Britannia Stadium in 2015-16. Kane scored six times in the three fixtures. It could be worse, though. The current worst record for one side against another in the Premier League belongs to Crystal Palace, who have gone 17 games against Manchester United without winning, losing 14 of those. To rub salt in Stoke's wounds, Saturday's result was their 1,000th top-flight defeat, making them the 15th side to reach that figure since its inception in 1888-89. The other 14 to lose a grand's worth of top-flight games or more are Everton (1,524), Aston Villa (1,459), Sunderland (1,300), Manchester City (1,289), Newcastle (1,261), West Brom (1,231), Arsenal (1,173), Liverpool (1,163), Tottenham (1,148), Bolton (1,144), Chelsea (1,122), Blackburn (1,052), Manchester United (1,025), and Middlesbrough (1,006). Kane has been prolific this season, but he is not the Premier League's top scorer. That honour goes to Liverpool's Mohamed Salah, who scored his 13th goal of the season in Sunday's Merseyside derby draw with Everton. Sunday's game was former Chelsea player Salah's 24th Liverpool appearance in all competitions since joining in the summer from Roma for a reported £34m, in which he has scored a total of 19 goals - the same tally he managed in 41 games with the Italian side last season. Everton were able to salvage a draw at Anfield thanks to Wayne Rooney's late penalty, awarded for Dejan Lovren's foul on Dominic Calvert-Lewin. This was despite Everton having only 21.01% possession in the game. It is lowest by an Everton side since Opta began record possession stats in 2003-04, and the third lowest by any Premier League side this season. Of the five lowest possession stats, four came against, and resulted in defeat by, Manchester City. While we are on the subject of possession, Manchester United recorded their lowest at Old Trafford in the Premier League since 2003-04 in Sunday's loss to Manchester City - only 35%. More on the game later. An 88th-minute header from substitute Olivier Giroud rescued a draw for Arsenal at Southampton on Sunday. It represents the 10th point the Gunners have gained from a losing position this season - a record matched only by league leaders Manchester City. France striker Giroud has proved adept at coming off the bench to good effect. This represents the 17th time he has come on and scored for Arsenal, level with famed Manchester United super sub Ole Gunnar Solskjaer in the all-time list of substitute scorers for one Premier League club. The most goals by a substitute for more than one club is 23, by former West Ham, Tottenham, Portsmouth and Sunderland and current Bournemouth striker Jermain Defoe. Speaking of Defoe, the 35-year-old was on target twice for the Cherries on Saturday in a 2-2 draw at Crystal Palace, taking him past the 200-mark for career league goals. Another English striker among the goals at the moment is Charlie Austin, scorer of Southampton's opener against Arsenal. He has only played 401 minutes this season but his five goals mean he is averaging one every 80 minutes. Going back a bit further into the 2016-17 campaign, his tally now stands at eight in his past 11 Premier League starts. Sean Dyche is building a reputation as a master of maximising the resources at his disposal. His Burnley side beat 10-man Watford 1-0 at the weekend, with Scott Arfield - a replacement for the injured Robbie Brady - scoring the goal that leaves them seventh in the table, level on points with Tottenham. There have been only nine goals scored in eight Premier League games at Turf Moor this season (six for Burnley, three for their opponents), fewer than at any other ground. Manchester City secured arguably their most important win of the season on Sunday, beating fierce rivals Manchester United 2-1 at Old Trafford to go 11 points clear at the top of the table. It represents a 14th straight league win for City, the joint best in the English top flight alongside Arsenal from February to August 2002. City's current points tally of 46 and goal difference of 37 would have been enough to seal eighth place in the Premier League last season.